The Nissan NV was introduced to the U.S. market in 2012 with hopes of grabbing a sizable piece of the full size cargo and commercial van market. Nissan geared their van towards customers with special needs. The NV has the much needed features and comfortable ride that are missing from many of the similar vehicles on the market. The NV is a great option for buyers looking for tons of space. Engineers designed the front of the vehicle with extra room for the driver and passenger. This makes getting in and out of the van a lot easier. In addition, the roof of the NV is available with extra height in order to provide more cargo space. Customers will find a variety of different loading ratings and two different trim levels. The NV's V6 and V8 engine choices give the van great power, with up to 317 horsepower capabilities. Customers looking to buy a used NV will find that the 2012 and 2013 NV only varies slightly. 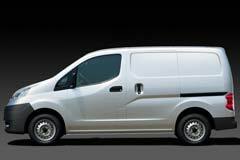 This can prove to be useful for those looking to get a good price on a cargo van. 2013 NV SV 2013 Nissan NV, Glacier White with 85137 Miles available now!